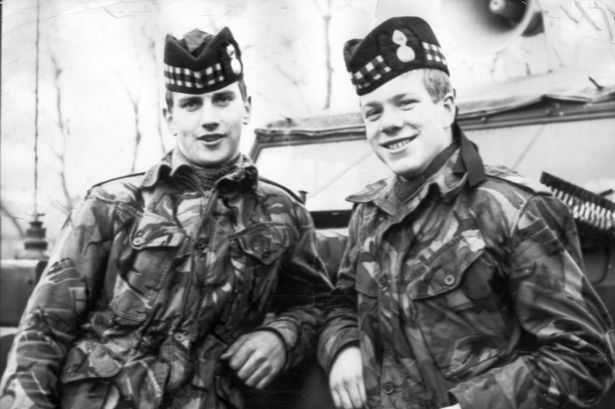 Although the IRA carried out a number of Honey Trap killings the despicable murder of the three young off-duty Scottish Soldiers outraged and shocked the UK and all decent people of Northern Ireland. Forty four years after the murders this still ranks of one of countless IRA atrocities that hunt the memory and in my book can never be forgiven. The three Scottish soldiers’ killings was an incident that took place in Northern Ireland during the Troubles. 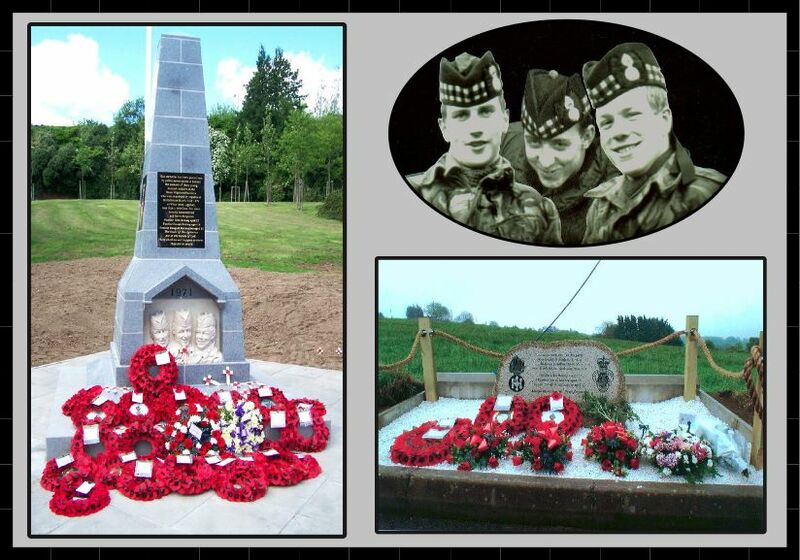 It happened on 10 March 1971, when the Provisional Irish Republican Army shot dead three unarmed British Army soldiers of the 1st Battalion, Royal Highland Fusiliers. Two of the three were teenage brothers; all three were from Scotland. They were killed off-duty and in civilian clothes having been lured from a city-centre bar in Belfast, driven to a remote location and shot whilst relieving themselves by the roadside. Whilst three British soldiers had been killed prior to this event, all three had been on-duty and killed during rioting. “all-out offensive action against the British occupation”. Provisional IRA Chief of Staff Seán Mac Stíofáin decided they would “escalate, escalate and escalate” until the British agreed to go. The IRA Army Council sanctioned offensive operations against the British Army at the beginning of 1971. 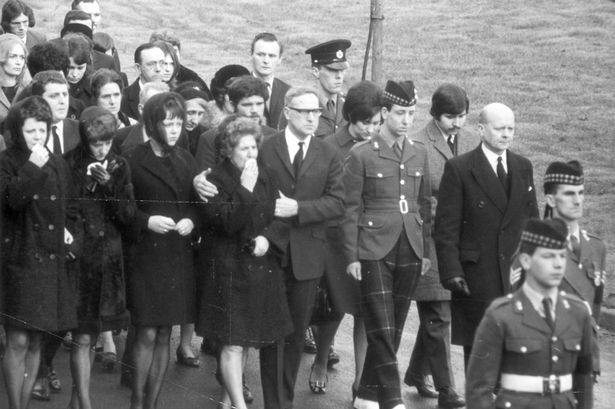 In this year, Robert Curtis was the first British soldier shot and killed by the Provisional IRA, on 6 February 1971, and two more soldiers were killed prior to 10 March. Brothers John and Joseph McCaig from Ayr and Dougald McCaughey from Glasgow in Scotland (ages 17, 18 and 23) were privates serving with the 1st Battalion, The Royal Highland Fusiliers, stationed at Girdwood barracks in Belfast. The shootings occurred on 10 March 1971 after the three soldiers had been granted an afternoon pass which allowed them to leave their base. McCaughey’s younger brother was serving in the same unit but was on duty and unable to join them. The three soldiers were off-duty, unarmed and in civilian clothes. They were drinking in “Mooney’s”, a Belfast city centre bar in Cornmarket, one of the safer areas of the city for soldiers at this stage in “the Troubles”. The three previous shootings that year had occurred in different circumstances, during rioting. One report said that the three Scottish soldiers were enticed into a car by Republican women who promised them a party. The three were taken to the White Brae, Squire’s Hill, off the Ligoniel Road in North Belfast. There they were murdered by Provisional IRA members; two were shot in the back of the head and the other in the chest. The inquest in August 1971 was not able to establish the exact sequence of events. It was established that all three were shot at very close range, probably in a line. All had been drinking, and Joseph was found to be severely intoxicated. “You may think that this was not only murder, but one of the vilest crimes ever heard of in living memory”. The bodies were heaped on top of each other with two beer glasses lying near to them After failing to return to their barracks by 18:30 the three were listed as AWOL. Their bodies were found by children at 21:30. The funerals were held in Scotland with John and Joseph McCaig buried together in Ayr. Their older brother, serving with the Royal Marines in Singapore, was flown home for the service. That day, 20,000 people attended rallies in Belfast and Carrickfergus. In Belfast, the cenotaph at the City Hall was the focus of the mourning with 10,000 people attending including workers from factories in a gathering that stopped the traffic in the city centre. Many wept openly. The Reverend Ian Paisley led the mourners in laying dozens of wreaths. The crowd observed a two-minute silence and sang a hymn and the national anthem. On 12 March, 4,000 shipyard workers took to the streets of Belfast to demand internment. The Northern Ireland Prime Minister James Chichester-Clark flew to London to request more troops, and when the numbers were not what he wanted, he resigned. On 23 March 1971, Brian Faulkner was elected Ulster Unionist Party leader and was appointed Prime Minister the same day. No one has been convicted of the killings. The Daily Mirror reported in November 2007 that three Provisional IRA men were responsible for the deaths: Martin Meehan (died 2007), Patrick McAdorey, and a third unnamed man. Meehan was questioned over the killings but was never charged. McAdorey was shot and killed in August 1971 during a gun battle in the Ardoyne area of Belfast. He was also suspected of the fatal shooting, hours before his own death, of Private Malcolm Hatton of the Green Howards. The case of the three soldiers is one of those being re-examined by the Police Service of Northern Ireland‘s Historical Enquiries Team. Honey Trap Soldiers memorial in Belfast. In 2010 the Royal British Legion Oldpark/Cavehill branch in Belfast raised money from the sale of badges to erect a memorial to the men. On 28 May 2010, a memorial stone was placed at the site of the killings on Squire’s Hill by the families and former regimental colleagues of the three soldiers. The next day a 15-foot obelisk incorporating carved images of the deceased was dedicated to the soldiers at nearby Ballysillan Avenue. A service of remembrance with regimental drums and colours was then held at Ballysillan leisure centre attended by around 1000 people including Lord Mayor of Belfast Naomi Long and North Belfast MP Nigel Dodds. The memorial at White Brae, Ligoniel, that marks the place of the killings was vandalised on July 2011. Sectarian graffiti was daubed on the memorial and the stones surrounding the memorial were scattered across the road. The ceremonial ropes were ripped off and the poppy wreaths that had been laid at a recent ceremony on 29 May 2011 to mark the first anniversary of the memorial’s opening were scattered across nearby fields. The memorial has been attacked on numerous occasions since, costing thousands to repair. Memorial vandalised again in hate crime. Since the erection of the memorial, there have been 23 attacks of vandalism. 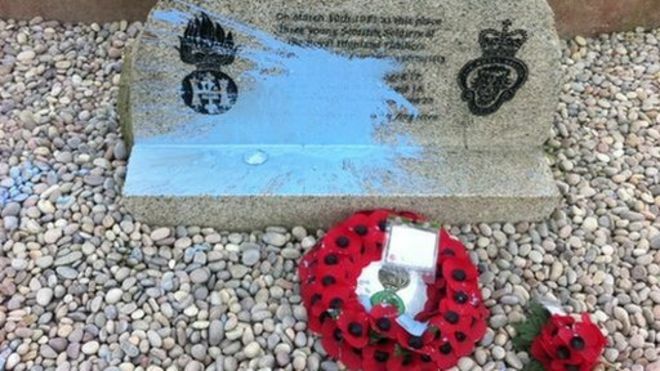 A memorial to three Scottish soldiers murdered by the IRA in north Belfast has been vandalised. Paint was thrown over the memorial at White Brae on the Ligoniel Road. Police said they are treating it as a hate crime. Jim Wright of the the Royal British Legion said it was the 10th time the memorial had been attacked in recent years. He described those responsible as cowards. North Belfast Sinn Féin councillor Gerry McCabe said it was a “despicable act”. “I’m saddened to hear that the memorial at the White Brae at Ligoniel to the three soldiers has been defaced by mindless thugs,” he said. They were the fourth, fifth and sixth soldiers to be killed during the Troubles and the first to be killed off duty. Veterans travelled from Scotland at the weekend to take part in a memorial service to the three soldiers at the spot where they were killed. Dougald’s cousin David, and former platoon sergeant Phineas Sloan were among those who travelled for the service. David said it made him feel “sick to the stomach” that the memorial to the soldiers has been attacked six times in 18 months. It cost £1,700 to repair last year, and after it was repaired was almost immediately attacked again. Thanks for getting in touch . I am grateful for your comments and pleased that you are happy with this post. My website/blog is dedicated to all innocent victims of IRA & other terrorist attacks , especially Armed Forces personnel whom have lost their lives as a result of the Northern Ireland conflict. I have written about the murder of many British Soldiers killed in the conflict by the IRA & other republican groups ( WarrenPoint ,Deal Bombing, Proxy Bombing etc. ) but the murder of these three young, innocent Soldiers struck a cord with me and many of my followers and I wanted to remember them on Remembrance day and remind people of their despicable murder. Please feel free to copy any articles from my website that might be of interest to you and if you follow my website/blog you will get automatic notifications of my daily post. it shocks me to no ends to see this killings in such a beautiful country. those to me were just babies. i shudder to think what would happen to me after all i an a part scottish not just an american but part of 2 different tribes of native american but as old as i ami would fight for my countryand its flags never giving even as much as an inch !!!!!!!!!!!! !